Abandon Ship gets bigger as its sails the Early Access seas. Age of Sail FTL-like Abandon Ship has received its biggest Early Access update yet. Titled Shattered Empire, the update's main draw is the addition of three new explorable areas on the game's map. Available starting with Act 2 and surrounding The Great Founding area, they each have a different theme. 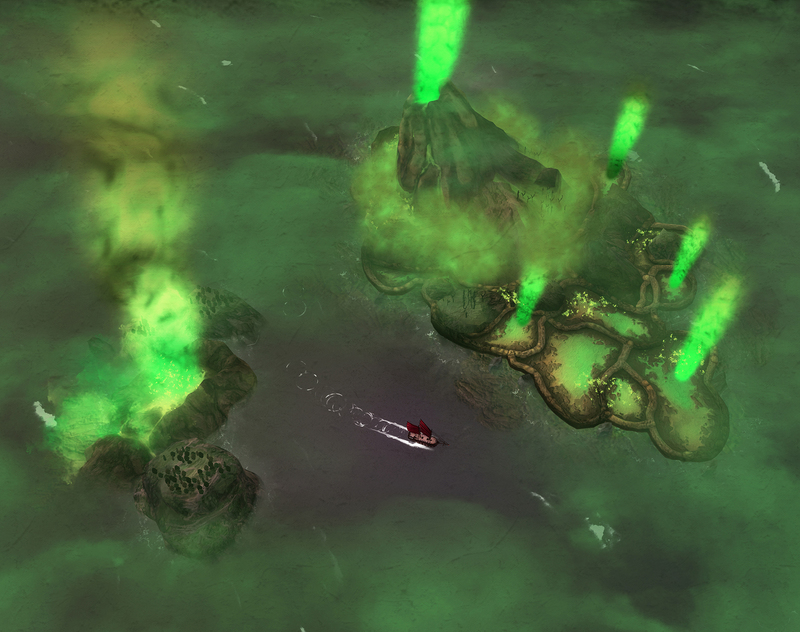 The Howling Seas will require your crew to brace, in combat, against its powerful winds; the Forsaken Seas are riddled with toxic fumes that not only reduce vision range but also sap at the health of crew members, while the titulary Shattered Empire houses two factions battling over one monument, alongside being the only place to acquire the new Plague Dart weapon. This new toy is an anti-personnel wepaon that caps affected crew's health at 66% while spreading to other nearby members. Abandon Ship's Shattered Empire update also adds the new Arid biome, alongside two new means to help with navigating its seas. Lighthouses, visible from afar, uncover the area map, while the Compass directs your ship towards undiscovered points of interest. Your decisions when encountering others now tie into a social system that tags them as friend or foe. A person you've saved might come around to repay the debt, while a castaway you've ignored can drop by to enact revenge, as long as they survive their predicament. Shattered Empire isn't, sadly, compatible with previous save games, so you'll have to rely on one of Abandon Ship's quick starts if you don't fancy going back to the very beginning. You'll find all the details on the update in this Steam post here. I previewed Abandon Ship when it first launched on Steam Early Access and found it to have a good amount of potential which, by the sound of its updates, it seems to be capitalizing upon.